We planted fruit trees almost ten years ago high up on our homestead and they’ve never fruited. Then, around three years ago, I bought Mr G a self pollinating variety on the advice of Arboretum garden centre manager Eamon Wall, an expert in the field of fruit growing. For the first time this year we’re seeing apples growing in our garden, branches bending, heavy with fruit, and we’re thrilled. 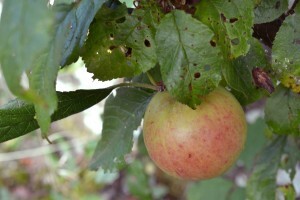 Apple trees can struggle above 600ft for various reasons including lack of pollinators, harsh winds and early frosts that damage the buds and at over 1,000ft we’ve not had much success with them. To be honest, we’d bought popular, cheap varieties (whispers not from a garden centre) when we should have looked for heirlooms or those more suited to our conditions, perhaps from Irish Seedsavers who have a fantastic collection. We have however, spotted some plums and pears growing on the older trees this year so we’re glad we haven’t given up on them. 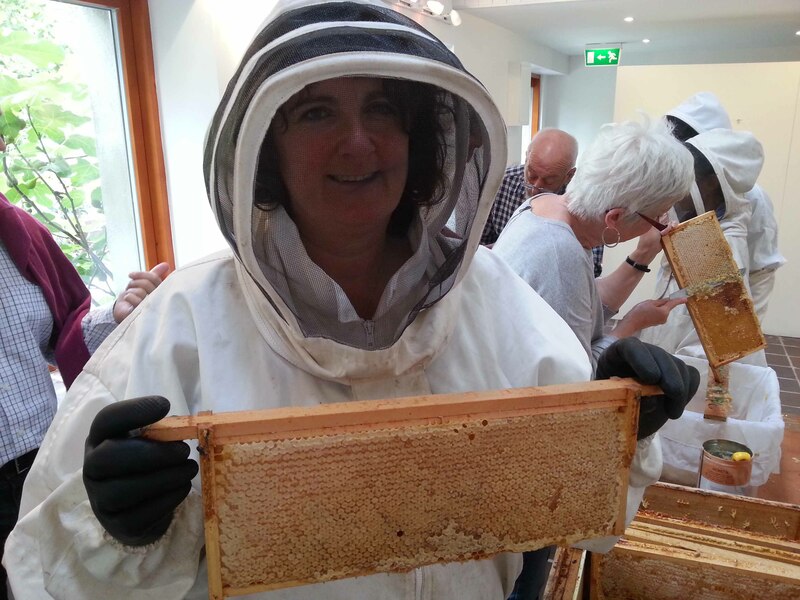 Perhaps it was thanks to our new bees, or simply that we had a mild winter followed by a dreamy summer here in Ireland, but this year we’re appreciating our new fruity treat. As the leaves turn golden our my mind turns to fruity puddings and cake. 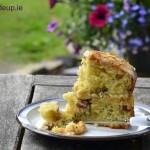 I was given this recipe for apple cake a few years ago by a friend and have mentioned it before but we enjoy it so much thought you might like to be reminded again. It’s delicious hot or cold, on its own or with cream. If you prefer a crumble topping with your apples, here’s a plum crumble recipe that’s topped with oats, nuts and syrup, just swap the plums for the new season apples. 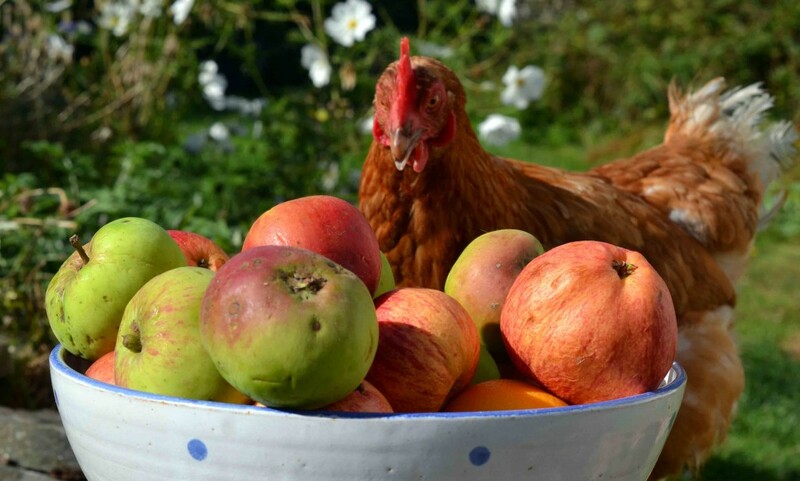 If you don’t have apple trees in your garden, perhaps you could ask friends and neighbours who might have them and exchange them for a cake, a great way to open up a conversation. 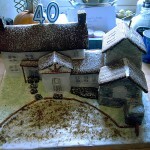 This isn’t the best photo I could have taken of it, but the cake was gone before I had time to snap a better photo! Heat oven to 160°C then grease and line a 20 cm cake tin which should be at least 7.5 cm deep. Cream the butter and caster sugar until light and fluffy. Beat in the egg. Sieve the flour and salt then fold in to the creamed mixture. Peel, core and slice the apples and squeeze lemon over the top to keep their colour. Arrange the apples on top of the cake mixture. Heat the jam and brush or pour over the apples. Take the remaining cake mixture, roll out and either cut into strips and make place over the apples in a lattice fashion or roll flat and place over whole. Sprinkle the sugar over the top. Bake in the middle of the oven for 1 hour. Cool on a rack and dust with icing sugar. Hope you enjoy the cake as much as we do. Do you have a favourite seasonal apple recipe? 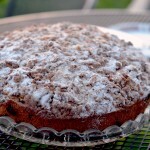 I baked another cake recently that was just a simple sponge recipe with chopped apples added to the batter, delicious! Hi. We use a fairly standard “Dorset Apple Cake” recipe here but this year we have made an impressive discovery and invented a new recipe all of our own! Take the standard recipe, leave out the sugar and apple, substitute in with grated courgette (ours are yellow ones this year) and feta cheese. Bingo! 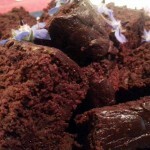 A lovely savoury cake to use as bread (spread with butter, top with e.g. hummous), or as the ‘carbs’ in your main meal as well as being an ace way of using up that courgette glut. Your delicious recipe has been nominated as one of the “Top 100 Best Apple Recipes of 2014 for National Apple Month”. 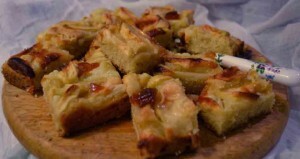 You and your readers can vote for it here: http://thefoodexplorer.com/fruit-2/100-delicious-apple-recipes-for-national-apple-month/ (position #35 – random order). Cool! Thanks so much. Have just had a peek and some delicious looking recipes over there. Community education – how measurable is it? I did an entry level gardening course with Dee a couple of years ago and couldn’t recommend her course enough. 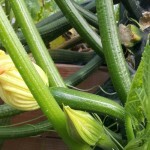 She knows anything there is to know about vegetable growing, is very free with her knowledge. Dee genuinely loves what she does and her enthusiasm is infectious. Her class was fabulous, engaging, fun and brimming with useful tips and hints. It truly takes the mystery out of growing your own. It’s my first year growing. Thanks to Greenside Up I’m aware of all the prep work and pest control so hopefully all will go well. I was lucky enough to attend one of Dee’s workshops last year. Her wealth of knowledge and her passion for gardening was quite obvious right from the start. She conveys the information in a clear, simple and engaging manner. I would highly recommend Dee. Dee is one of the most inspirational entrepreneurs I know. Her passion, commitment to sustainable practices & generous sharing of her extensive knowledge have benefited local communities and individuals alike. Dee is one in a million. She shares her knowledge with many and has a very loyal following for her community garden work, training workshops and social media postings . Besides her obvious talent for gardening and building a business from scratch, Dee has the ability to put her customers at the heart of everything, even when they call at the weekend to sort out a crisis.